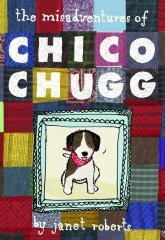 In this totally enchanting tale of the mishaps and other delightful adventures shared by Chico, a lovable small pet dog with his owners, the Chugg family, is beautifully told with expressive descriptive dialogue and the emphasis on looking at the world from a small dog's point of view. Janet Roberts is a mother of three and an ex primary school deputy head. She retired early, sold her house and now lives on a narrow boat with her husband and their Jack Russell Chico. What is 16 - 9 ? I bought this book for my two nieces, one of whom lives in New Zealand. They really loved it and so did the 'grown-ups.' I have had the honour of meeting Chico in real life and can honestly say that he's just as adorable as in his fun filled stories. Can't wait for the next book, there's a 'few' other smaller people looking forward to it too! we just love this book, its great for the whole family! we met chico and jan at our school today, cico is a massive hit with everyone and jan is so passionate and inspiring, we really hope she wins! I bought this book for my twin 7 year old nieces: they were thrilled today to meet Chico in person today! I read the book before giving it to my nieces & it is a lovely, well written, beautifully descriptive story, giving you enough information to let your imagination fly. I live the work that Jan is doing in schools as a result of this book: Jan and Chico truly deserve to win the first prize. Stumbled upon this book through Mike. Loved reading the extract, very well written and it makes me want to read more, which is good enough for me to vote for this delightful story it seems. Well written and I reckon it's not just for children. Will recommend it to others once i have written the whole book - and I will. My daughter was thrilled to meet Chico when Janet Roberts visited her school. She enjoyed the extract that Janet read and we have bought the book to finish at home. What an enchanting read. Bought one each for my neice and nephew, could not resist having a read myself, it was fab!!! I haven't read this but the author read it at school and it seems like a really good book. This one get's my vote. Lovely story! Hope the next one is just round the corner. My 10 year old daughter throoughly enjoyed this book. Fantastic story, realistic and wonderful characterisation and very funny. My son loved it being read to him and has since read it himself. Can't wait for second installment. I own Scrappy and love this book and the way Janet has captured him on paper. A great read fro adults and children. My daughter loves this book and can't wait for the next one to be published. A lovely book about a lovely little dog whose adventures have captivated our grandchildren. Well done Jan, looking forward to the next one. Great read Jan - we are really looking forward to the next book. My children loved it! Please vote for this book, it totally derserves to win! My son loves this book and can't wait to read the next one! Anji & Harley can't wait until the next episode. Trevor and Harley loved Chico's exploits. Harley would love to meet Chico on the towpath! A fantastic story that hooked my class completely because it was so real and amusing. We loved it and await the next ones eagerly. A lovely read and lot's of fun! Really enjoyed the book. The children loved it and so did I. Can't wait for the next book. Lovely and charming story, told from the unique perspective of a jack russell puppy! My kids loved it and laughed all the way through! Great to read to younger children and be read by the older ones! A beautifully written book that all the children love to read. This book was filled with action and some funny scenes. My kids absolutely adore Chico, and I loved reading it to them. It's only a matter of time now before they will be reading it again on their own! "This is when it all became a bit of a blur...". Witty, brilliantly written, and superbly set. It doesn't take long before you learn to eagerly anticipate the clever build up in every chapter. Kudos to Ms. Roberts on her delightfully imaginative storytelling! This book will leave you wanting to read more of Chico Chugg's new misadventures....Is it too soon to ask for seconds? This book is an absolute treasure! Beautifully written, the dialogue is descriptive and engaging. The imaginative scribbles add great colour to the text. This book is an immediate classic, a wonderful addition to memorable children's literature. More books please and perhaps soon an animated film! I really enjoyed reading this book to my children. They really grew to love Chico and the Chugg family. Looks like a narrowboat holiday this year then!